As the Faslane community of end-of-the-world survivors enters its third month, thoughts and hopes turn towards the return of the questing fleet. But the base-dwellers’ trials are not over yet. A new enemy emerges from within, threatening to destroy everything they have worked for. After tackling the evils of Level Four, and overcoming a major energy crisis, the underground outpost’s citizens have hit their stride in their bid to build a viable society. But the challenges along the way have taken their toll on the production schedule. Jake Noah and his voyagers are expected back soon, so efforts must be redoubled. Not everyone is riding high on a wave of optimism. Hidden away from the others, Captain Wickham Grey awaits news that could change their destiny. And one among them is about to turn against the community. Faslane is about to meet its biggest challenge yet. 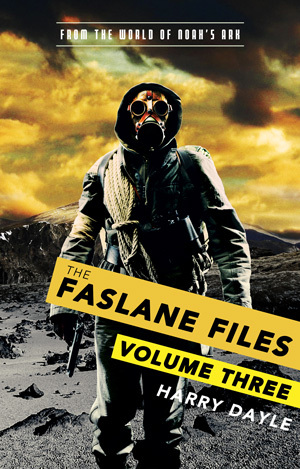 The Faslane Files: Volume Three concludes the exciting trilogy set in the world of Noah’s Ark.